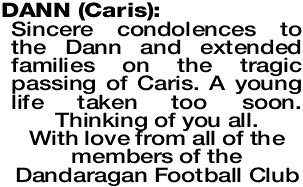 The Funeral Service for Caris Marie Dann of Moora will be held in the Moora Performing Arts Centre (Town Hall), Padbury Street, Moora commencing at 11.00am on FRIDAY (05.04.2019). 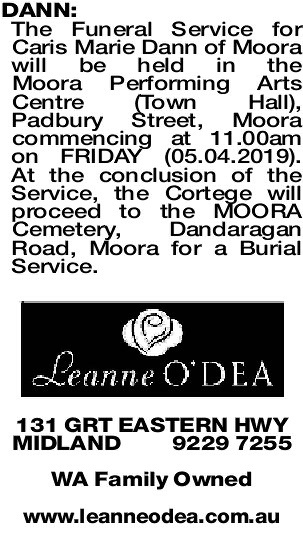 At the conclusion of the Service, the Cortege will proceed to the MOORA Cemetery, Dandaragan Road, Moora for a Burial Service. 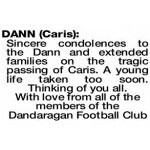 DANN CARIS Sincere condolences to the Dann and extended families on the tragic passing of Caris. A young life taken too soon. Thinking of you all.